It may not have quite the reach of Spider-Man or Wonder Woman, but it’s a name you can say outside of comics circles and trust someone there has heard of it, if not read it. Given that the character was essentially spun from whole cloth by Neil Gaiman and Sam Keith, the series’ trajectory and popularity over the last 30 years is remarkable. While Gaiman has dipped his toe back into Sandman and his kingdom of The Dreaming on occasion, it’s a pretty rare occasion. He’s said that part of the great joy of working in comics is handing your creations off to someone else and seeing what they become, though that’s surely easier to say when you have a good royalties deal on the level of those early Vertigo successes (Grant Morrison famously bought a castle off of the initial royalties from Arkham Asylum). While others have certainly played with the toys Gaiman either created or popularized — Mike Carey, Peter Gross, Caitlin R. Kiernan, Peter Hogan, John Bolton to name a few — there has never really been much of a passing of a torch. Nobody really took over Sandman, so there wasn’t a torch to pass, and no matter how good books like Lucifer or The Dreaming were, no matter if they did things better, nothing really took off like Sandman did. Enter The Sandman Universe, a manufactured passing of the torch with Gaiman as a nebulously defined storyteller helming a team of writers and artists on 4 new comics: The Dreaming, House of Whispers, Lucifer, and Books of Magic. I don’t want to romanticize that early Vertigo era — it’s the byproduct of suits seeing green from books like Swamp Thing — but I can’t imagine any of it felt as like as much of a cash grab as The Sandman Universe has. 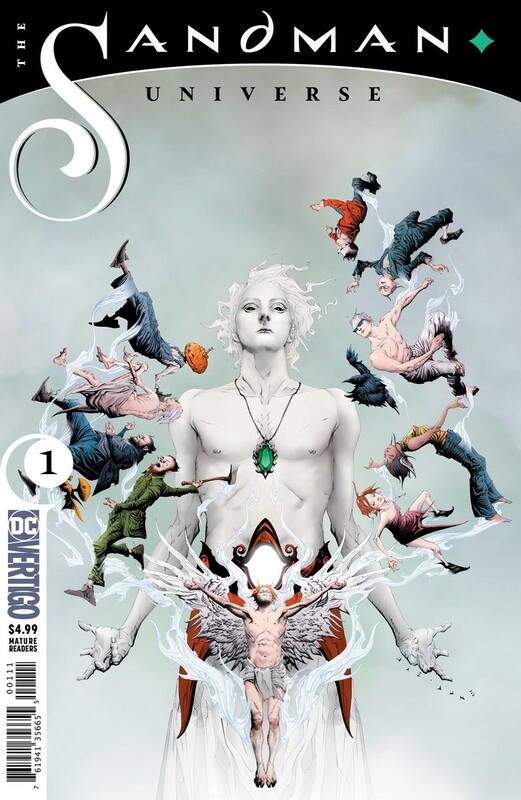 After fans of Sandman bought and re-bought and sometimes re-re-bought the series as trade paperbacks, absolute editions, and annotated editions, there is very clearly a market for The Sandman Universe with Gaiman at the helm. Yet The Sandman Universe #1 is a $5 commercial, like buying a ticket to the movies and being shown just the trailers. The continued bookstore sales success of Sandman is one of the few sure things in comics, yet when DC wants to do a spinoff series, they charge readers for the privilege. Having read the first issues of The Dreaming and House of Whispers, I can tell you that The Sandman Universe #1 is not so much preview as it is prologue. Perhaps calling them “required reading” is an overstatement, but there is not a reader of The Dreaming or House of Whispers who wouldn’t benefit from having read the exquisite corpse that is The Sandman Universe. I will surely be saying the same thing when Lucifer and Books of Magic come out as well. This isn’t the first time DC has screwed up marketing for series targeted outside the typical cape-and-tights comics reader — indeed, that was the goal of DC You, to bring new blood in to monthly comics. Each of the series in that initiative had a short, digital-only prologue that nobody working on the titles seemed to know what to do with. Some thought it was a great opportunity to give future readers an idea of what to expect, a done-in-one story that would introduce people to the character(s) and their world. Others looked at it as an “issue 0” to lay the groundwork for the issue that would arrive in comic shops — it was free, after all, what would stop anyone from reading it? Of course, these comics were inexplicably not available in ComiXology. There was nothing indicating that readers of Omega Men might be missing something when they opened that first issue, either. There were comic shops that had no idea DC had these preview comics stored online or where to find them. This blunder from a few years back is why I am disappointed but not surprised by The Sandman Universe #1. But because I’m some kind of fool, because Lucifer is tied with The Invisibles as my favorite long-form comic series, I bought it. And I was won over by what each of the creative teams were selling, for the most part. It didn’t hurt that DC axed Young Animal and without it I would have 4 fewer series to buy each month right when they were releasing 4 new series aimed at the not-quite-cape-and-tights crew. So I’m along for the ride, and I guess I’m dragging you with me.